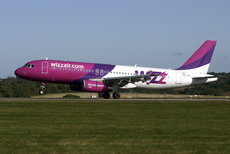 Wizz Air flight W63689 from Iasi, Romania, was on final approach to runway 12 at Tel Aviv-Ben Gurion Airport, Israel when the first officer noticed a drone. The captain immediately took evasive action by lifting the left wing. The approach was still stable and the aircraft continued to land uneventfully.